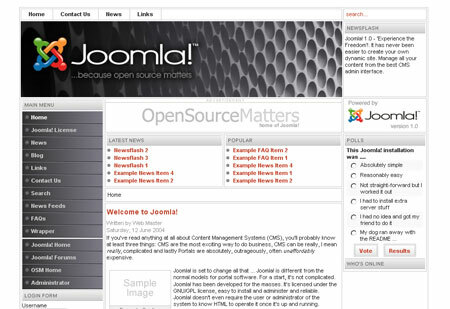 Joomla, the award winning Content Management System (CMS), currently One of the best open source CMS in the world. Joomla is known for its ease of use, even for those of you who doesn’t understand programming at all. The name Joomla came form the Swahili word jumla which mean “all together” or “as a whole”. The name was chosen from many other suggested names to reflect the commitment of the development team and community to the project. This baby’s first official release was Joomla! 1.0.0 and it was announced on September 16, 2005. This was a re-branded release of Mambo 4.5.2.3 which comes with some bug and security fixes. With just several clicks and in several minutes, your Joomla site is up and running. Like I said earlier, Joomla is very easy to install, has a very attractive design, the content management is also very easy to understand and used. This is what makes it very popular, even more popular than Mambo. post and the numbers are just keep growing. What Can I Build With Joomla? You could build various website with Joomla, starting from a simple personal site, intranet site, community site to a complex e-commerce site. You could do all of it with Joomla. Joomla is very easy to modify, unlike other open source CMS, in Joomla you could add components, module, mambots or even a new template right from Joomla back-end. You don’t have to do the hard work to install or upload it to your server, just leave it all to Joomla. Speaking of components, modules, and templates (CMT). Joomla has tons of it. There are lots of free and commercial CMT available on the internet, all you have to do is search it in Google.